Prices for management consulting services declined 0.9% in the third quarter, following a decrease of 1.1% in the second quarter. 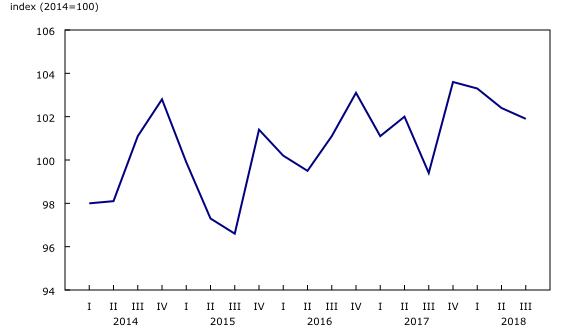 The price index for management consulting services has trended downward since the start of 2018. By contrast, the price index for environmental, scientific and technical consulting services posted its largest quarterly increase (+3.8%) since the series began in 2014. Since the first quarter of 2018, the price trend for these consulting services has diverged notably from the trend in management consulting services. While the index for environmental, scientific and technical consulting services has increased each quarter in 2018, the index for management consulting services has decreased every quarter since the start of the year. The growth observed for environmental, scientific and technical consulting services coincided with favourable economic conditions in the resource extraction industry in the first half of 2018. The index rose 2.5% in the third quarter compared with the same quarter in 2017. This was attributable to higher prices, on a year-over-year basis, for both management consulting services (+2.2%) and environmental, scientific and technical consulting services (+4.5%). The Consulting Services Price Index is a quarterly survey that collects information on the prices of various types of consulting services, such as management, environmental, scientific and technical consulting services.